In terms of chemistry, Gorilla Glass is actually an alkali-aluminosilicate sheet toughened glass. In other words it is a thin, tough glass used to protect your cell phones, laptop computers and millions of other portable electronic devices. It is manufactured by the U.S. glassmaker Corning Inc. The physical properties of the glass are that it is hard, thin, lightweight and scratch resistant compared to other glasses. Its hardness is comparable to that of sapphire that is 9 on the Mohs scale of hardness in contrast to regular glasses which is much softer and comes close to 7 on the Mohs scale. The more the hardness, the less likely you are to scratch your phone or monitor from daily use or contact with other items in your pocket or wallet. As mentioned earlier, the glass consists of a thin sheet of alkali-aluminosilicate. The glass is strengthened with the help of an ion-exchange process that forces large ions into the spaces between molecules on the glass surface. The glass is than placed in a 400°C molten potassium salt bath, thereby forcing the potassium ions to replace the sodium ions of the glass. The larger potassium ions take up more space between the other atoms in the glass. When the glass gradually cools down, the crunched-together atoms produce a high level of compressive stress in the glass thus protecting the surface from mechanical damage. 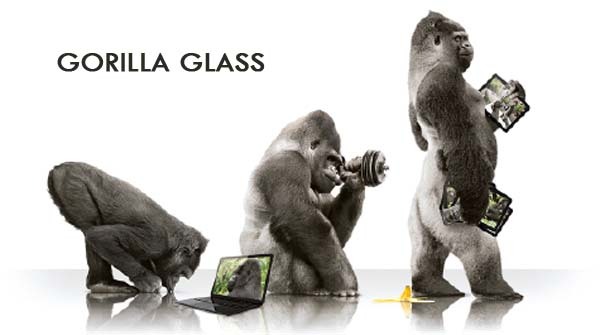 Gorilla Glass is a few decades old. The glass was originally named “Chemcor” and was developed by the Corning in 1960. In its initial days the glass was manufactures only for racing cars, where strong, lightweight glass was needed. Steve Jobs introduced it in the mobile market. In 2006, he contacted Wendell Weeks, the CEO of Corning to order for a scratch-resistant glass for Apple’s iPhone. With its success, other mobile companies also joined it. Gorilla Glasses comes in two types. Gorilla Glass 2 is the recent form of Gorilla Glass and is up to 20% thinner than the original material but maintains the same amount of toughness.